The African Queen 2005 Diary Page. See what we got up to last year. Most trips producing 20-30 plaice on the Skerries, up to 3lb. in weight, expect some bigger fish to show soon. Bad days only producing 10-15 fish with other bits and pieces, but hey, as the old saying goes - a bad days fishing beats a good days working. East winds are always a killer for the fishing, and boy, we've had our fair share of them this month. Another old saying - When the winds in the East, the fish bite least, When the winds in the West the fish bite best. Best days will be middling tides with sunshine and light winds. A string of beads with small spoons and flashers a 1/0 fine wire hook baited with ragworm or lug tipped with squid seems a consistent bait but peeler will generally find the bigger fish. All the plaice caught will be full of sand eels about 2-3 inches long, so why does a small strip of sand eel or mackerel not catch as well as worm? The angler who experiments and cracks that one will be in for some fantastic sport. I'm on the case but nothing conclusive yet, watch this space! Wrecks still producing a few Pollack and some nice ling, good to see the mackerel are back again, won't be long before we see a few bass I hope. May 2005 East winds again, really messing up the fishing. Plaice are hard work but we can normally find a few, plenty of mackerel now showing, Summer can't be far away. When we come into a settled spell of weather the fishing should improve........ May 11th. Still no sign of the winds abating, we have not got out on a trip for ages. At the moment the winds are still in the East and forecast up to force 7 or 8. Bang goes another weekends fishing..... May 21st. Another Weekend, another cancellation. Force 6-7 South or southwest today and tomorrow, we had a Southerly force 9 on Thursday night, force 7 on Wednesday. Watch this space, I'll be back with some news soon, I hope! May 26th. Still haven't managed to get out, but looks like the bank holiday weekend might be ok. Hope to have a proper report soon. May 28th. Gale force 9 South Westerly. May 29th. Good day at last! light winds, plenty of sunshine, some nice Plaice, bags of Whiting and as many Mackerel as you want to catch. Here's a few piccys of the week. Click to enlarge. June. Some decent weather at last, Plaice fishing has become difficult on the Banks on most days, I'm not sure that it Isn't down to the profusion of Sandeel fry that is all over the banks at the moment, although a few decent fish are still showing at times, they are not easy to catch and are jammed packed with fry. If feeding is that easy, why would they want to grab our offerings? Some good quality Whiting to be had on the deeper side of the Skerries with the odd surprise Fish showing. A few smallish Pollack and Ling still to be had on the Inshore Wrecks given the right tide and weather. Mackerel aplenty, and the Conger are starting to bite. Still waiting to see any significant numbers of Bass. June 14th. Managed to find some nice Plaice when the tide was moving, then went off to drift the wrecks, Still getting Pollack on jelly's but the average size is between 3-6lb with only the odd bigger fish. If they are not wanted for the pot we tell our anglers to bring them up slowly so they can stand a chance of going back to grow a bit. With a bit of thought we can look after these fish for the future. For those who don't know, fish bought up too quickly from depth (we're catching them at 200+ feet) will suffer from the pressure change and get the 'bend's' like divers can and will not be able to swim down again. Some piccys of the week, amazing how the Women consistently catch good fish, pheromones? Again click to enlarge. June 21st. Plaice very slow on the Skerries, this is always the case through June/July, we'll expect to see their number's increase during August. There are plenty of whiting, with the fish being a good average size, Mackerel by the million. Still no real signs of the Bass or the Blonde Ray arriving, with only the odd small fish being caught, so, being so bereft of decent fishing for our anglers, we have been looking for Conger on the smaller tides, they are very obliging at the moment and we have had some nice fish to 60+ lbs. All have been returned alive! It's so pleasing for me to see how our angler's attitude's have changed over the years towards their quarry. The fishmonger angler's of old don't come any more I suppose, now the fishing is in decline. The one's who are left seem dedicated to their sport and will enjoy a day with a poor catch as much as a good day. Most if not all of their fish is happily returned. Still getting the odd good Pollack, but even these are thinning out. A few poor photos of the last weeks events. 25th/26th June. At last! a few Bass starting to show, let's hope the pair trawler's have left some decent fish for us. Will get out on a few dedicated Bass trips these coming weeks I hope, when the weather's fit. (East wind's again, lost half of Sunday's trip, had to retire to the pub with the lad's.) Fished the Skerries on Saturday for a poor but interesting mixed bag, a couple of Plaice, School Bass, Whiting, Red, Tub, and Grey Gurnard, Mackerel, Doggies Sandeel, Pout, Garfish, Pollack. 12 species in all. July 2nd/3rd. Lumpy weekend again, small tides, no Bass but managed a reasonable 2 day's fishing for the lad's, given the conditions. Saturday we found some nice Bullhuss on a reef mark up to 12lb. All female's, all were in pup, so all were returned (as were the Conger's). Sunday we anchored one of our wrecks that has been kind to us over the last few month's, and had Conger up to the mid 20'slb's, the big Eel's eluded us. Pouting by the lorry load, 'Wreck Rat's' one of our angler's called them, and a few small Pollack. Where is all this wind coming from? It's been with us for most of the season so far and is forecast to continue until Friday this week. Let's hope we get some better weather soon. A few piccys of the lad's weekend. Click to enlarge. Weird Crab. One of the Pouting had a Crab in it's belly, I've been scrabbling around rock pool's and beach's since I was old enough to stand up and have never seen anything quite like this one. I don't seem to be able to find a reference to it, so If anyone can identify it, I would be extremely grateful. It's only 2" across It's back and has lost a lot of it's colour, (reddy brown) and some of It's leg's. The eye's which appear to be on the corner's of it's carapace (shell) are actually on 'stalk's', like a Hermit's, but they swing back into two 'groove's'. Click on this link to some picture's of it. July 5th-9th. Fishing has gone right off for some reason, Mackerel seem to have almost disappeared and not a lot else biting, it's funny when you can see fish mark's showing on the sounder but no one's catching. as one wag put it, 'if you caught fish every time you went out, it would be called catching not fishing' all well and good, but frustrating just the same. We will be taking live Sandeel's out on Sundays charter to try for some Bass. Report soon. Sat. 9th. Took out a corporate charter to view the Classic Channel Regatta race in Start Bay. Weather was gorgeous and every one had a great time, apart from the Yacht's who didn't have enough wind for a good sail. All boat's entered must be 25 year's old or more, the oldest entrant we know of, was built in 1894. All these classic craft were built in an age when boat's were very elegant and beautiful. They will all set sail for Brittany tomorrow (Sunday) and then join in with French yacht's racing to Guernsey, and back to Brittany. 10 day's racing in all. Sunday 10th.July. First proper day Bassing with live Sandeels, Result - 1 Bass about 21/2lb. We steamed miles trying to find a few Bass, have the pair trawlers finished them off?, they should be about in numbers by now. We did manage to find some reasonable size Pollack and some big Mackerel to keep the lad's happy, but I can certainly see that there will be a change in the future for us. The so called conservation system for most fish species is clearly not working. As of December 2006 'red' diesel will no longer be around, at the moment we can use duty free red diesel but it is still unclear if we, as charter skippers, will be allowed to after 2006. If we have to pay 'road' prices (about £5 a gallon at the moment) it would triple our fuel bills, all boats are by nature 'fuel hungry', and fuel is one of our biggest expenses. Margins are tight enough as it is, with the lack of fish already having an impact on the bookings we receive, to pass on what would be a massive increase in the cost of our fuel would be suicide to our business. Various bodies are fighting our corner at the moment, with the PBA (professional boatman's association) being our best hope, so we will just have to wait and see. Saturday 16th. July. Had a slow week without many trip's, weather has been gorgeous, flat calm and hot. No Bass still but still finding a few Mackerel although they are not as prolific as in recent week's. Had some reasonable Pollack on the reef's. Lot's of other species around to keep everyone interested, Load's of Garfish, catching the odd Pilchard (Sardine) on the feather's when Mackereling and Scad (Horse Mackerel). Got let down by our Saturday crew, just didn't show up. They booked the boat over a month ago and like a fool I didn't get a deposit off them. It was a cracking neap tide with good weather. I was looking forward to anchoring a wreck and catching some decent Conger. We could have booked this day several times over had we known the lad's had a problem, all it take's is a phone call. So feeling pretty down this morning we were sat on the boat alongside the wall when we were asked to take out the Wives and family's of a crew of local Gig racers who were completing an arduous 24 hour crossing of the Channel. (Brittany to Dartmouth, about a 100 miles) We were told they were flagging and the sight of their Wives and family out at sea would give them a boost - Did it! -, we got to them when they were still 4.5 miles out to sea. The Families shouting encouragement and the kid's waving their flag's was a sight I will never forget. The Fella's (and one Lady) in the Gig were going along at 4.7 knots, but, with their loved one's beside them their speed increased to 5.1 knots and they kept that up for the next 3 miles. We shadowed them all the way into Dartmouth with an ever increasing flotilla of boat's the closer we got to shore, there was a good reception waiting for them when they arrived back home, with a good crowd, champagne and telly cameras. Well done the lot of you, it was a privilege to be with you at the finish. Sunday17th. July. Caught 10 nice conger with 4 rod's plus all the usual bits and pieces, nothing huge, but some nice fish to 35lb. Skerries not producing much at all, plenty of bit's and pieces, Gurnard, Whiting, Mackerel, etc. but only the odd Plaice. We haven't seen any big Blond Rays as of yet, we had a few small one's earlier in the season (caught by 'accident' whilst Plaice fishing) let's hope they are still on their way. 18th. - 20th. Had a party of Angler's down staying onboard, the weather which has been great, turned with a vengeance on their arrival. Westerly wind's in excess of 20 knot's (gust's up to 33 knot's on Tuesday afternoon) have kept us pinned in the Bay all week, and put any fish the trawler's had left off the feed. We have been sharing the Bay with up to 6 trawler's at a time, I guess they have had the same problem as us in not being able to get offshore to their favored marks. They decided that with the weather and the lack of fish, to go home 2 day's early, a blow to our finance's and a black mark for Dartmouth. Are we actually going to see any Bass or Blond Ray this year? I am beginning to wonder. 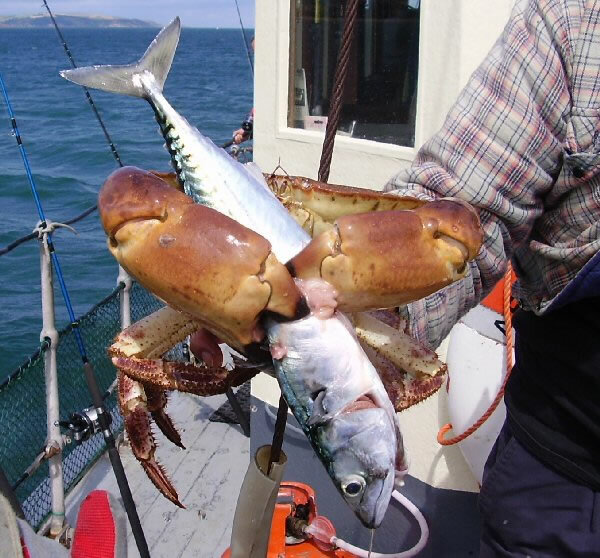 The highlight of the Lad's fishing week was sadly only a large Brown Crab that had grabbed a Mackerel bait, somehow he was very quickly named 'Buster'. Click on the link to see picture. Thursday 21st. Well! what a difference a day make's, Mackerel everywhere, Whiting by the box full, a couple of nice Pollack off a wreck at low water, and 14 nice size Bass to cap a brilliant day. My pessimism from yesterday has proved to be unfounded, although the Bass were only of a moderate size, they were all, baring 2, over the 65mm minimum size. They were all caught on a variety of artificial lures, and you can't help wondering what would have been if we had been using live Sandeel's. Let's hope they stay around for a while. We have had to cancel Saturday's trip because of the forecast, and we have a party of angler's booked from Plymouth on Sunday, they were due to arrive armed with live Eel, but it look's like the weather is going to stuff us again. The forecast is for S.E. 5-6 with rain. Monday 25th. Had a half day out at sea only, 3 Bass, load's of large Mackerel, Pollack and bit's and piece's. This is the time of year when we should be making our money, school holiday's have started, Dartmouth is filling up with holidaymaker's and a lot of them want to go fishing, so what do we do, sit on the wall and fend off hoard's of people that want to part with some of their hard earned money going fishing. Can you believe we are nearly into August and it's tipping it down with rain and blowing best part of a gale. So, another week gone by and no money earned. Weather forecast is set to continue foul until at least the weekend. Friday 29th. Wind has moderated to a fishable level and we managed a full day, plenty of Whiting, Pollack, Mackerel etc. No Bass, but a very enjoyable day. The only story to tell is of a fish we caught that I have never seen before, it was identified as a CHUB MACKEREL, normally found in the southern hemisphere, we have checked the sea fish records and it is not listed as ever being caught in British waters. So, we have had the weight verified and have submitted the fish for inclusion on the rod caught record list with the N.F.S.A. Will keep you posted as to our progress. August. Fishing very poor, as always' we seem to have plenty of Mackerel, most day's the Whiting are in abundance with the bit's and pieces that we always' pick up. We can normally anchor for Skate on the back of the bank's at this time of year and find a few, this year so far, they have been non existent. The commercial pressure on the inshore fish is never ending, one crabber out of Dartmouth is reputedly fishing 6 miles of gill net's for Ray on every neap tide, this is in addition to the 500 pot's that they normally fish. I reported that we found a good shot of Bass on an evening tide on a very small sand bank out of Dartmouth one recent evening, we caught 14 Bass and had 12 takable fish (between 8 angler's) the next morning we returned to the same mark to find 7, yes SEVEN commercial fishing boat's slaying the Bass, this was apart from the multitude of private boat's that had heard of the fishes arrival. This all happened on a weekday, not a weekend. The consequences are that we have had a maximum of 3 Bass on a tide since. Today 06th. August. in desperation to give our crew a pull on their rod's we anchored a reef mark that has always' given us reasonable Bull huss along with countless doggies, today we struggled to catch 1 doggie and not a lot else, one of the problem's we face on a daily basis is fishing along with up to 6 trawler's in the bay, they are apparently fishing for Cuttlefish which give them a good return on their effort's (£6.50p per kg) but of course they will catch everything else that is swimming in the same water, with Plaice fetching £3.30p per kg they make a nice little bonus for the fishermen, and this is probably why they forget themselves and regularly 'slip' over the line into the no trawling area on the Skerries bank. We are only seeing the odd Plaice in our catches', but to be fair, as we are in the middle of the 'Grockle' season, we have not had the 'proper' angler's to properly fish for them. This will be addressed this weekend when we have the Northampton Bus Angling club down for the weekend. The lad's are good angler's, and can normally catch Plaice if they are there. I will let you know. Also some of the lad's are staying on next week and if the weather is fit we will be going Sharking. Watch this space. Sat. 13th. August. Fished in very windy condition's which were not ideal for catching Plaice, wind's were force 5-6 S.W. with a lot of heavy shower's. We managed 9 Plaice to only 1lb. 4oz, with a good one (2-3lb) lost at the side of the boat. A few bit's and piece's of other fish, the normal Gurnard, Whiting, Mackerel etc. Sun. 14th. Aug. Fished hard with good bait for just 2 Plaice, both small. The lad's decided to abandon the Plaice fishing in favour of a species hunt competition, at the end of the day, 3 of the team's of 2 on the boat were on 10 species each, and they had to extend the fishing to bring their competition to a conclusion. We had angler's fishing tiny hook's with scrap's of bait in an attempt to catch something obscure (this was in 130 foot of water) eventually the competition was won and the lad's bought a frustrating weekend to a close. These guy's have fished with us every year for the past 5 year's and although they were a couple of week's earlier than they normally come, they have never had fishing so poor out of Dartmouth. I think we will see them again next year, but if thing's continue to decline at the same rate over the next 12 month's, they will not bother again and we, as well as Dartmouth will be the loser's. 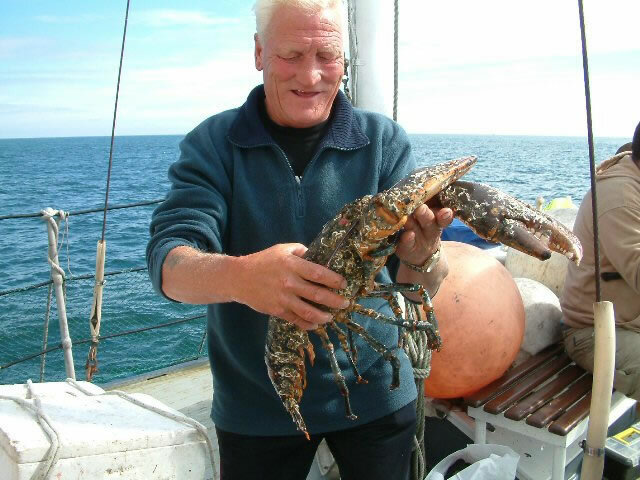 A lot of our angler's are telling the same story of poor fishing at Port's around our coast, where traditionally they have always' had good fishing. Why do some of the Weymouth boat's steam 50 mile's, and some Plymouth charter boat's 35 mile's to fish the Skerrie's bank. Their local fishing must be finished if they have to put in that much effort. Monday 15th. Aug. Got out on our Sharking trip, fished a tide that in retrospect was probably too small for good result's. Did not catch or see a Shark all day. Two thing's I will remember of the day are that EVERY wreck between Dartmouth and the area we chose to fish, which was 14 mile's off, was gill netted! we did catch some nice size Whiting on the small rod's, but we could have done that much closer to home. On the way home we came across a family group of about 20 Dolphin's that were in high spirit's leaping out of the water and generally showing off in a way that only Dolphin's can, we had a Mother and calf swimming in unison under the bow of the boat, one of our guy's took some brilliant video of them, unfortunately with an analog camera, not a digital. If I can find a way of converting it, I will put it on the web site. Every one on board that day will remember that sight for the rest of their live's, how can our Government's allow the pair trawler's and the gill netter's to kill these magnificent animal's. I just cannot understand it. The U.K. Government has the power to extend the pair trawling ban out past the present 12 mile limit, but it chooses not to, this is only to appease the French, who only see Dolphin's as predator's on THEIR fish. 16th.- 19th. Nothing out of the ordinary to report, good weather, lot's of fish but with nothing of any real quality. A couple of nice Pollack, and a good sighting of a Sun fish the highlight of the week. Thank's to Chris Varlow for the pic of the Sun fish. 12th.September. Took out a few of our regular's from Plymouth today to fish the Skerries Bank, they are all experienced fisher's and have been fishing for Plaice with us for 4 years, if the fish are there they will always' get a good catch. They only managed 12 nice Plaice and 3 Dab's between them, plus the usual bit's and piece's, that was it, a small day but with the nice weather it was enjoyable all the same. 17th.-18th.September. Biggest tides of the year, up to 5.3m, this made for difficult fishing, but we managed to find a few over the slacker period's as the tide was turning. A few more pic's to look at, if you click the Seagull photo you will go to an album of picture's of Seagull's feeding behind the boat, they are magnificent animal's when viewed in their natural enviroment. Took advantage of the big tide's to get some maintainance work done on the boat, we have to antifoul twice a year along with numerous other job's that crop up from time to time. the latest job in hand was to replace a cutlass bearing on the starboard prop shaft. The port side will need to be replaced soon, I noticed that the sacrificial keel is getting very tatty with the aft section missing completley. This will have to be sorted over the winter. Another saying which rings true in the boating world: 'A Boat is a hole in the water surrounded by wood, into which one pour's money.' never a truer saying. 24th. Sept. Another weekend of big wind's, had the Royal Oak fishing club down from Stoke on Trent for a 24hr. trip, went out Saturday morning into best part of 20 knot's of Easterly wind so ended up fishing in the river mouth for just a few Mackeral, back on the mooring by dinner time. Lad's were all in the pub by 2.30pm. 1st. 2nd. 3rd. October. Dartmouth fishing festival, an annual competition we look forward to every year. The crew we take out have been fishing the festival for over 20 year's and have seen some serious change's. The number of entrant's in the 80's was over 800. Last year there were 288, this year we had 180. This was is some part due to the forecast, which was very poor for Saturday and Sunday, with winds easing Monday. The forcasters were right for a change, and that was exactly what we had. The lad's had a couple of bouncy day's in fairly big tide's, caught quite a few fish, but again nothing of any real quality. We caught a nice Whiting on the Saturday and a decent Pouting on the Sunday which we didn't think would stand a chance at the weigh in, so the lad's elected to stay out, fishing instead of coming in early to weigh in their fish. On the Monday evening at the prize giving it turns out that both of these fish were the largest of their species caught, and would have won a prize. Why we can't have a phone in number to check on the biggest fish weighed in so far, is beyond me. It would give the anglers a target to chase and would stop a lot of fish being killed just in case they might win a prize. On the Sunday we chose to fish an inshore reef for Conger, two very big fish were lost, and the biggest of the one's we landed was 28lb's. Was this big enough for a prize?, should we kill it just in case?, no one wanted it to eat, where could we find out what the biggest landed so far was? Well, we couldn't, there is no system to do this, so we decided to keep the fish alive in a net bag alongside the boat untill the weigh in that evening, and then carry it in a bin bag to be weighed, after which it was put back into the River, hopfully to find itself a new safe home. Battered, bruised and a little miffed I'm sure, but still alive, not like all the other Conger that were weighed in over the 3 day's. One guy fishing from his own boat was intent on winning a prize at any cost, and caught about 150 Wrasse to get one big enough to weigh in. Any angler will know that just catching a Wrasse is probably enough to kill it (the pressure change) how many of them fish died? Without any doubt he would not have been fishing for them if it hadn't been for the potential prize at the end of it. Next year I will campaign AGAIN to get the 'phone in' system adopted by the organizer's. Click the link if you want to see all the result's. All the big Bass that took the prize's were caught up in Lyme Bay on the wreck's with live bait's by the 'commercial' rod and line angler's. They just weighed in the biggest fish before they took them all to Brixham market. Saturday 22nd. October. .Found a small weather window in a very windy week, took out a small group to fish the inshore ground's, as seem's to be the pattern of late we can catch plenty of fish but the bigger fish seem to be well offshore still. We were hopefull of finding some Codling among the Whiting on the deeper bank's, but didn't. We caught some Whiting, Mackeral, Scad, and Gurnard before we went off to fish one of our favorite wreck's as the tide eased. A dozen or so reasonable Pollack, and a shed load of Pout with a bonus Bass followed, with the wind's ever freshening from the West we headed back in by 4.30pm. A fun day, and a bonus to actually get out at this time of year. As the water temperature drop's over the next month or so, we should see some bigger fish moving inshore.